I am quite a movie lover and during my free time, I always watch a movie or two either on a television or in cinemas. I watch a wide variety of movie genres: action, drama, martial arts, musical, 3ds; even Korean love stories with subtitles. Yes, I watch them all. 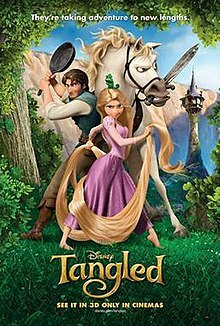 Tangled was one of my recent watch. Captivated, I researched about it and found out that it was six years in the making — well, it was quite evident. The songs, animation, script, and overall story were all grand and fascinating. Tangled was a ‘derivative’ story of Rapunzel, this time her hair glows when she sings. The hair was quite the center of the story because it has healing powers. What is more interesting is that the life-like strands of hair that can be seen in the movie were created using discrete differential geometry, one of the newest fields in mathematics. Mathematicians from Columbia University and Free University of Berlin had to consider how 150,000 strands of hair interact with other strands, gravity, friction, air, and so on, and come up with mathematical equations that would model them. The animators of Tangled characterize their work as ‘principled’ and ‘beautiful.’ New York times explains more. What he and others mean when they refer to work as “principled” or “beautiful” is that the images on screen are not the result of a patchwork of technical tricks, but of precise mathematical equations based on the way the world actually looks and operates — in a word, physics. They use what is known as discrete differential geometry, a field so new that the first textbook on the subject was published only two years ago. Merry Christmas everyone. Despite the busyness due to Christmas season, Math and Multimedia still remains active. Here are the summary of posts for this week. To those who want to give love this Christmas, you may want to donate (via GMA Kapuso Foundation) to the flood victims in Southern Philippines. More than 1000 people were killed and hundreds of families were left homeless. Many of us are familiar with the Twelve Days of Christmas — a song that enumerates a series of increasingly grand gifts given on each of the twelve days of Christmas. For those who are not familiar with the song, here are a few stanzas (for full lyrics, click here).